NBA Stats: Is it time to start promoting Bucks’ Malcolm Brogdon as this year’s ROY? When the Bucks made this selection of Brogdon in the second round of last year’s draft, there wasn’t much fanfare, in fact, most Bucks fans probably had little idea what the team was getting with Brogdon. Almost a year later, the team, its fans, and the NBA are taking notice of Brogdon and his play on the court. At the All-Star break, Brogdon is averaging 9.4 points per game, 2.7 rebounds and 4.2 assists. He is also averaging 25.6 minutes per game, an unusually high number of minutes on the court for a first-year player, let alone a rookie who was drafted in the second round. While the Bucks brass may be pleasantly surprised with Brogdon’s play, imagine the surprise of the rest of the NBA. In fact, you could certainly make a case for Brogdon as this year’s Rookie of the Year. Yes, a second-round player garnering a ROY Award! Well, let’s take a moment and make the case for Brogdon as ROY. First, Brogdon has scored 517 points, most of any of the rookies taken in the second round. His closest competitor is fellow second-rounder Isaiah Whitehead of Utah who has scored 338 points for the Jazz. Not bad, you say. But here’s where things get interesting. 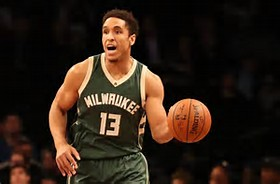 In looking at all players taken in the 2016 NBA Draft, Brogdon’s 517 points ranks first; yes, that’s right, he has scored more points than every player taken head of him in the draft. His 9.4 ppg ranks first among players drafted in 2016, as does his 4.2 assists per game. He also has 2.7 rebounds per game, not bad for a rookie guard… that stat ranks seventh among the draftees. His aforementioned 25.6 minutes per game ranks second among 2016 draftees (L.A. Lakers 2016 selection Brandon Ingram tops the list). There is still a whole half of a season to go, but continued strong play from Brogdon will certainly keep his name near the top of the list for 2016-17 NBA ROY. One more note about second-round draft choices by the Milwaukee Bucks. Brogdon has gotten off to a great start as the Bucks 2016 second round choice. But past history has shown us that the Bucks have selected a few other “gems” in the second round of the NBA Draft. Here’s a look at the most career points in the league by players who were drafted in the second round by the Bucks. There are 15 players drafted in the second round by the Bucks who scored 3,000 or more points in their NBA careers. Of these 15, five never put on a Bucks uniform.